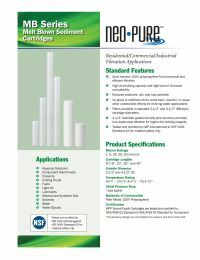 The Neo-Pure MBG-25098-01 is a High Efficiency 9-7/8" Polypropylene Sediment Depth Filter, which is a reliable and economical solution for pre-filtration in many applications. 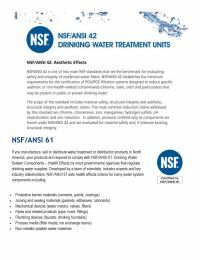 Ideal applications range from, SDI (service deionization) systems, and CDI (continuous deionization) systems, to reverse osmosis systems. The 9-7/8" sediment depth filter, like FCRO cartridges, offer greater surface area for longer life and greater dirt holding capacity. Neo-Pure MBG-25098-01 filters are listed for food contact applications in Title 21 of the U.S. Code of Federal Regulations. NSF Certified The Neo-Pure MBG-25098-01 has been tested and certified to NSF/ANSI Standard 42 & 61 for material safety components.